When shopping for a new or replacement central air conditioning unit, there are a number of things to consider. From the initial cost of the unit and installation to the complexity of ongoing maintenance, making a decision purely on price is a mistake you’ll pay dearly for down the road. Whether you are a Wisconsin resident of Washington or Ozaukee County - or you live in another state, with rising electric costs, energy efficiency is always a factor. A low cost air conditioning unit may seem affordable now, but if it is not energy efficient, higher utility bills will quickly eat up those initial savings. If your AC unit is 10 years or older, it’s a good idea to replace your air conditioner sooner rather than later due to a Freon phase-out mandate by the EPA that began about 25 years ago. • In 2014, 50 million pounds of R22 Freon was produced. • In 2016, 18 million pounds was produced. • In 2018, 10 million pounds will be produced. • In 2019, less than 5 million pounds will be produced. • R22 production will completely stop in 2020. With these statistics in mind, it becomes increasingly obvious this creates a supply and demand problem for homeowners with AC units 10 years and older. The EPA intentionally designed the phase-out this way to push homeowners toward more energy efficient units. Since 2000, air conditioning units have been produced using an environmentally friendly replacement Freon known as R-410A. Unfortunately, it is not possible to simply swap out R22 for R-410A, since this would be the equivalent of running diesel through a gasoline engine. Since the price of R22 Freon is already expensive and is expected to continually rise in cost through 2020, there is no better time to upgrade your AC unit than now. 1. Cost savings - Many older AC units operate at less than 65% efficiency, meaning that 35% of the money you use to cool your home is wasted. Newer systems are far more energy efficient, and that means less wasted energy and less money spent. 2. Better comfort control – New, energy efficient AC units are easier to control, with simpler temperature settings and more consistent cooling. 3. Programmable thermostat compatibility - With a new AC unit in place, you can install a programmable thermostat to keep your home comfortable at all times, day or night. 4. Better airflow - Newer AC units have better airflow than older, less efficient units. This reduces energy usage and eliminates common bottlenecks. 5. Quiet operation - Older AC units are often noisy, but newer, energy efficient central AC units can be nearly silent. High efficiency, energy efficiency, BTUs, SEER rating, ENERGY STAR – what does it all mean? When shopping for a new air conditioner, the acronyms and different ways to distinguish a good unit from a lesser unit can be overwhelming. • What is a SEER Rating? A high efficiency air conditioning unit is defined by its SEER rating. This measure of efficiency is technically known as the Seasonal Energy Efficiency Ratio, and it represents the volume of cooling divided by the amount of energy used. Many older central air units had a SEER rating of less than 10, while newer high efficiency air conditioning units can be twice as efficient. That higher level of efficiency means lower energy costs and greener operation for Wisconsin area homeowners. As you shop for a new or replacement central air conditioning unit for your home, you will want to first become familiar with the SEER rating of all units you are considering. The SEER rating is designed to rate the efficiency of air conditioning units and this gauge will be very helpful as you shop. • What is the Best SEER Rating? The best central air conditioner ratings will depend on a number of factors, including the size of your home and the required energy efficiency of the unit. SEER ratings go up to 20, and a SEER rating of 20 simply indicates the highest level of efficiency that particular air conditioning system is able to achieve. • Energy Efficiency vs. High Efficiency – What’s the Difference? At first blush, an energy efficient air conditioner and a high efficiency air conditioner may seem like the same thing, but there are some key differences to be aware of. An air conditioning unit may be rated as energy efficient, but its efficiency still may not be enough to meet modern standards. It is important to not only review the projected energy consumption of a central air unit before you buy, but you also need to understand the SEER rating. Buying a unit that meets or exceeds the required SEER rating for the state of Wisconsin is a good place to start, but in general, the more efficient the unit, the better. • How Do You Know If an AC Unit is Energy Efficient? If you purchased your central air unit more than a few years ago, it may not be as energy efficient as it should be. Standards are changing all the time, and advances in the industry mean that the newest units are also the most energy efficient. When gauging the energy efficiency of your central air unit, take notice of how quiet the system is and how high your utility bills are. If you have noticed a spike in your cooling costs, your old unit may no longer be efficient or powerful enough for your home. • What is the meaning of BTU in Air Conditioners? BTU is the acronym for British Thermal Unit, and it is simply a unit of measurement for energy usage. One BTU is the amount of energy that would be required to raise the temperature of a pound of water by one degree Fahrenheit. When you shop for a new or replacement central air conditioning unit, you will see its power rated in BTUs. The higher the BTU rating, the greater the cooling capacity of the system. It is important to choose a central air system that is properly sized for your home, and just as important to avoid a unit that is either too large or too small. • ENERGY STAR - What is it and What Does it Mean? No doubt you’ve heard this term before, but do you really know what it stands for? The ENERGY STAR system is a government-backed gauge of energy efficiency, and it is one of the most trusted symbols of efficient operation. This rating was designed to serve a number of purposes, including reducing greenhouse gases, cutting down on energy consumption, and protecting the power grid during times of peak power usage. The ENERGY STAR rating is a very important thing to look for when shopping for a new air conditioning unit for your home. • What is the Minimum Energy Efficiency Standard for Air Conditioners in Wisconsin? The requirements for energy efficiency in the state of Wisconsin changed at the beginning of 2015. As of January 1st of that year, the standard for energy efficiency was changed to reflect regional requirements, and for northern states like Wisconsin, air conditioning units must now carry a minimum SEER rating of 13 for split systems and a minimum of 14 for single package central air conditioning units. Knowing the minimum energy efficiency standards for air conditioning units in Wisconsin is very important. After all, those Wisconsin summers can get pretty hot, and you need to know your AC unit will keep you cool and comfortable. Keep in mind, however, that the minimum may not be enough, and it is important to choose a central air conditioning unit that is properly sized for your Wisconsin home. Jackson Hardware Heating & Air Conditioning is the area's leader in top quality air conditioning installation and repair, with a full range of Lennox equipment to enhance your summer comfort. 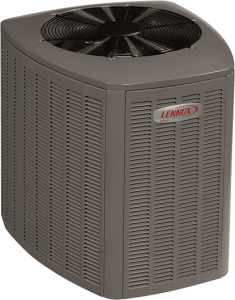 Lennox has long been the recognized leader in the world of air conditioning, with 5-star ratings and top quality design. If you have been looking for an exceptional air conditioning unit at a great price, Jackson Hardware Heating & Air Conditioning is the perfect place to start shopping. Call us today at (262) 677-3477 with questions and we’ll help you find the perfect air conditioning unit for your home. What is the most energy efficient air conditioner? There are many things to think about when choosing a new or replacement central air conditioning unit for your Washington County or Ozaukee based home. Here are some timely tips to help you get the biggest bang for your air conditioning buck. Buying an AC unit that is too large for your home means spending more money than you need to. In addition, you’ll be missing out on the right level of energy efficiency for your home. An AC unit that is too small might not be able to keep up with peak demand and you’ll find yourself running the unit all the time – once again, missing out on achieving optimal AC performance for the size of your home. Noise level is a very important consideration when choosing a central air unit, and living with a noisy system can be quite trying. A properly sized unit should operate quietly and efficiently; if you can hear the unit running, it might not be as efficient as you think. 3. Should I Repair my Existing System or Buy a New One? Repair or replace an AC unit – it’s a common question…for good reason. There are a number of factors to consider when deciding whether to replace an existing unit or purchase a new one. From the difficulty of maintaining an old system to the expense of a new unit, there many things to think about. Jackson Hardware Heating & Air Conditioning can help you with this decision. We are the leading specialist in HVAC repair and replacement in Jackson, Grafton, Cedarburg, Mequon, West Bend and all of Washington and Ozaukee counties. As your certified Lennox dealer since 1919, we are the leading authority on the industry’s best and most energy efficient heating and cooling products. Our goal is to repair or replace your system in a timely manner, with as little disruption to your day as possible. For priority service or emergencies, call us at (262) 677-3477. No matter what time of day you call, you’ll always speak with a live person! If your old central air conditioning unit is not as efficient as you would like, it might be time to retire your current system and take advantage of recent improvements in HVAC technology. Replacing your old and inefficient central air unit with a newer high efficiency unit can lower your cooling bills, keep your family cool and comfortable and even improve the state of the environment. No matter what size of home you own, when you need HVAC repair or replacement in Jackson and surrounding areas, contact Jackson Hardware Heating & Air Conditioning! If you're looking for the most energy efficient air conditioner, we'll help you choose a new central air unit that is efficient, affordable and easy to use. For priority service or emergencies, you can reach us by calling (262) 677-3477. We are available 24/7. Great service, new unit, same day in our case. Very satisfied customer and would highly recommend them! We had a great experience with Gary from Jackson Hardware Heating and Air Conditioning. Our 25 yr old furnace had given up the ghost so I had several companies out. We picked Gary because he was honest and performed the appropriate tests to see if our furnace was working or not. He replaced our furnace two days later and he had two other men working with him. They were finished by 1100 in the morning. They left my basement cleaner than when they came and explained everything to me. Gary even made a fort out of the furnace box for my three yr old son. He decorated the fort with toys and made windows and a door. Gary went above and beyond! We will have him out in the spring to replace out air conditioner. I highly recommend Jackson Hardware Heating and Air Conditioning! Thanks Gary, Tom, and Ike! The Jackson Hardware Heating and Air Conditioning crew were here this morning, on time, at 8:30am. They were replacing a 20 year old furnace in our Mobile Home. It was not an easy take out and install, but, Gary and his crew handled it with relative ease and professionalism. They took the utmost care of our home and property and when they left you couldn't tell they were here. When finished with the install, Gary checked all the connections for leaks and the vents for air flow. He also checked the thermostat to make sure it was properly installed. They were done with the job shortly before noon and I can't say enough good things about their service and their prices. Gary and his crew at Jackson Hardware Heating and Air Conditioning get 5 gold stars from me. Thinking about having a furnace repaired or replaced, give them a call now. You won't be disappointed with the results. Fantastic organization and fantastic people, including Gary's father Tom, who is a delight to talk to. Great job guys. Thank you so much for your professionalism. Amazing experience with them! Gary and Mike both came out to look at my air conditioner after I received numerous quotes from other companies that were very expensive. Very responsive as I called and they came out within the hour. And I received great service at a very reasonable price. I will be using them for all my furnace and air conditioner needs from now on! We decided to be proactive and replace our 31 year old AC and Furnace. Gary and his team arrived on time, and in 6 hours replaced my units with new Lennox equipment. They took the time to explain the process of bleeding the AC lines and why, advised for a furnace filter option that needs to be replaced every 2-3 years instead of monthly, and were professional in every aspect. Leveled off my AC pad and gave tips on how to save energy costs when operating each unit. I would recommend JHHAC for all your AC/Furnace install or service needs. Gary came to fix my air conditioner within hours of my call during the first heat wave of the season. He explained what was wrong and I learned that the service I received from his competitor last year never fixed the problem. I trust Gary. I learned a lesson and will only have Jackson Hardware and Heating & Air Conditioning repair or replace my AC or Furnace. Gary is professional, skilled and honest. I used Jackson hardware for service twice. One of those was an emergency call and they showed up on time and completed the work on a Sunday! I have recently had them install my home central air. They did a great job making a preliminary stop to see what size and type of AC we needed. Installation was done in less time that predicted and you couldn't tell they we there, left the work areas as good or better than before they arrived. Totally satisfied and would recommend them. Thanks for a good job. Jackson Hardware Heating & A/C service technician's are extremely friendly and polite. They are honest, punchial and provide you with all the information you will need to run your new furnace and air conditioner. Our ac went out on the 2nd floor. Called them immediately and received same day service. Tony came out and easily fixed the problem. He explained everything he was doing, was very professional and very nice. Extremely reasonable pricing too Jackson Hardware Heating AC & Tony: You Rock! I called six places near me for a furnace humidifier. Only 2 got back to me. One took 3 days and Gary of Jackson Hardware who was on a job returned my call quickly the same day I called. His price was fair so we set a day for the work. He called early that morning to confirm if time was still good and arrived on the job 30 minutes later with Mike. They knew what they were doing and finished quickly without any disruption or mess. He did a good job explaining all things important and we now have humidity levels that are healthier. Great job guys! I do recommend this company.